As the largest strike in recent history approaches its one month mark, Verizon’s 40,000 striking workers are benefitting from an outpouring of public support, while the company faces growing criticism and potential fines for its shoddy service. Schatschneider said that because of the heavy rains of the past several weeks, any pollutants released to the environment are too dispersed for cleanup operations. She said her office believed Verizon was in violation of the law, because it did not continuously institute any best management practices at the site, such as using filtration equipment or transporting the pumped water offsite via a tanker truck. CRN reports that Verizon “channel partners and the industry at large” are beginning to feel the effects of the strike. Since Verizon owns much of the telecommunications network infrastructure across the country that consumers, businesses and even competing service providers rely on for the delivery of voice and data services. "Very difficult to operate on Friday and Thursday," Sciortino said. "Most of our cars come in on the weekend and no one was able to get a hold of us on Thursday and Friday to make appointments. My bays have been pretty much empty." @heartandc: @VZWSupport another business with out service Verizon can't fix. End the strike!!! Stop the insanity!!! @caro_matos: @verizon @VerizonSupport in what WORLD is that acceptable? Why were we of all people canceled on? I need Internet to do my job. Meanwhile, supporters are rallying around Verizon workers and helping them continue the strike as long as it takes. In Bethlehem, MA, the owners of FamilyWize Community Service Partnership are offering striking workers a discount on prescription drugs after Verizon stopped funding employee health plans. In Massachusetts, Hamden County sheriff Michael Albano hammered his Verizon phone to pieces in solidarity with striking workers and then tweeted about it. And actor Paul Bettany uses an interview with Verizon-owned AOL to give workers on the picket line a shout out. Jennifer Masferrer, a single mom, works at a call center in Upper Macungie Township. Hers is one of the centers the company is threatening to close, and if it does, she'd have to take a job in Philadelphia, which would mean a round-trip drive of at least three hours. Finding child care for an eight-hour day plus a three-hour commute is hard enough for most parents — but for a single parent, it's virtually impossible. Added to that, one of Jennifer's three daughters, 10-year-old Maddie, has a host of special needs after surviving a drowning as a toddler. New York is one of the most prosperous states in our country, but is also one of the most unequal. One of the main reasons that large companies like Verizon do everything possible to maximize profits and take everything they can from workers. Rhode Island blogger Andrew Stewart joins Verizon workers on the picket line. He includes plenty of photos of strikers still going strong, and notes their broad support from the Bernie Sanders campaign to community groups like Jobs with Justice. Photo by: Zarrin Tasnim AhmedVerizon employees carry signs that say "Fighting Corporate Greed at Verizon Wireless" outside of the Verizon store in Wareham Crossing. 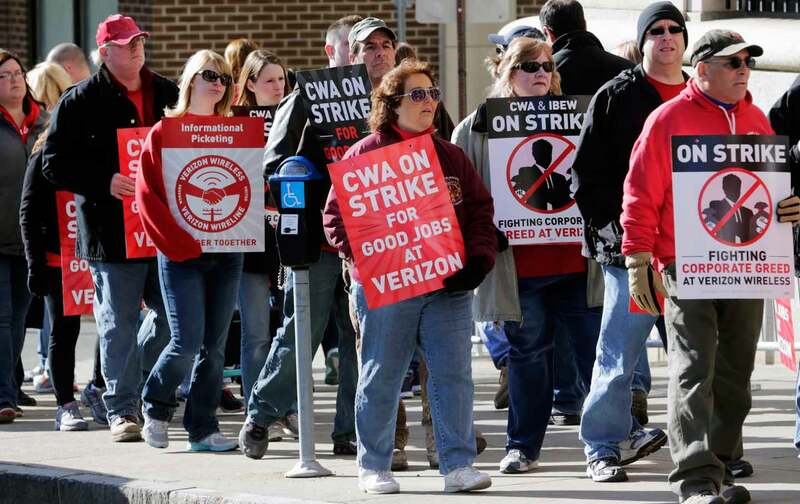 Verizon Strike Causes Delays For Customers Around U.S.
Verizon CWA & IBEW Union Members Go on Strike: America's Communications Future is at Stake.